Continuing my latest Tokyo trip, my friend kicked me out of his place early on a Monday morning as he went to work. Normally I'd be annoyed, but this was a perfect opportunity for me to visit recently Michelin starred Tsuta. Before they got their star, they used to just have long lines. 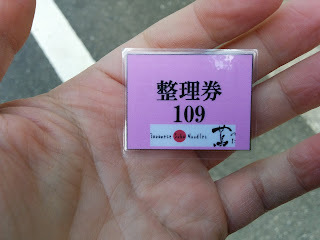 Now, though, you need to visit extra early in the morning to pick up a ticket. I got my ticket, allowing me to come back five hours later. When I did, I still waited on line for almost an hour. Once a minute, some poor tourists would come by hoping to hop online, only to be rebuffed and told they were many hours too late. Finally I was let in, and ordered the yakibuta egg shoyu soba. I can understand why this is the first shop to earn a Michelin star. The delicate soup is made from a mix of different kinds of shoyu, producing a light if woody, smooth flavor, with a finish that tasted a bit like truffle oil. The noodles were medium thin and tan, full with a grain taste. The yakibuta were slices of red pork that were full and juicy; an extremely well done version of the Chinese-style barbecue pork you find in some bowls of chuka soba. The other toppings didn't shine as much as the soup and noodles, which meant they were just very good. 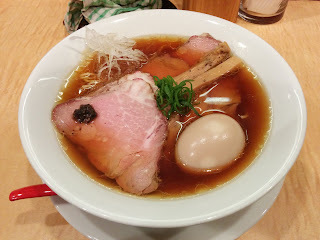 The egg was creamy and flavorful and the menma were thick and fibrous. A high class, high quality bowl of ramen like this is more than deserving of a Michelin star. The lining up twice to get in has turned me off from trying to visit. But after hearing good reviews especially from you, I feel like I might finally give it a go next Tokyo trip. Yeah, it's a bit ridiculous but I happened to be up and about early anyway.